I've just read the Holtham Commission's final report. As with the first report last year, it's clear and thorough, yet it didn't strike me as being a particularly groundshaking piece of work. When I'd finished reading it I found myself asking, Is that all? But—perhaps tacitly acknowledging that there are political difficulties in implementing a new formula because of how Barnett benefits Scotland—the report repeats its recommendation that a floor be put in to protect Wales until a proper formula is agreed. Despite both Peter Hain saying, and Peter Black believing, that a floor has been put in place, it hasn't. The report also says the 114% floor they suggested before was deliberately conservative. The political impasse will be hard to break. In my opinion it can only be broken in one way: to acknowledge that Scotland will get substantially less money on a needs-based assessment, but to make up for that by giving Scotland a fair share of the revenue from North Sea oil and gas in its waters in compensation. At present Barnett is trying to be two different things at the same time, and until the two things are separated, there will never be an acceptable political solution. But this will involve the UK government having to concede the principle that—in part at least—it is Scotland's oil and gas. That is a big bullet for the UK to bite. This is the most uncontentious part of what the report has to say. Wales already has a £500m "overdraft" facility for short term balancing and, perhaps by coincidence (or perhaps not) the Treasury announced yesterday that Wales would be able to access the small discrepancy between what the Welsh Government spends each year and what it is entitled to spend: the year end flexibility that equates to about £200m. Taken together, these should cover short-term fluctuations. The block grant already includes elements for capital expenditure, but there is no scope for independent long-term borrowing for infrastructure improvement. Up to now the Treasury have resisted this on the grounds that Wales and Scotland do not have a guaranteed income to service any long-term debt because each comprehensive spending review is only for three years. It was on this ground that the Treasury made such a fuss over the funding for the new Forth bridge in Scotland, effectively trying to tell the Scottish Government to do it by PFI or not at all. Of course the idea that Wales and Scotland might not get any money in the next CSR was laughable, and the report poured scorn on it. So what is being recommended is that borrowing should be allowed only for capital expenditure. Holtham envisages that this would be on the same basis as local authorities can borrow now, namely through the National Loans Fund or Public Works Loan Board because (at Treasury rates) this is the cheapest way of doing it. I won't question that this is cheaper than borrowing commercially, but it fails to take account of the Treasury's eagerness to cut back on all borrowing. It may well be that other sources will be the only way of actually getting money, so I'd urge Westminster not to prevent us going to commercial lenders. We might well be able to devise new methods of borrowing that are similar to PFI in that the borrowing is not classed as public borrowing, but ensure that what would otherwise have been private profit for the PFI consortia is recycled back to the public purse instead. Where this final report breaks new ground is on the ways in which the Welsh Government can be made responsible for not just spending money, but for how the money it spends is raised. The point of principle is that any body that spends large sums of public money should also be at least partly responsible for justifying how that money is provided. After considering the pros and cons of each form of existing tax, it draws very much the same conclusions as Calman: that income tax is the best tax to be devolved. In two respects what Holtham proposes is better than Calman (and in my opinion should therefore apply to Scotland as well, though the report doesn't say that). The first improvement is that instead of "everything but 10p" applied to both tax bands (basic and higher ... but I guess also the new rate as well) it should be half of each tax band. The second improvement would be that the Welsh Government could set different rates for each tax band. I have to say again that there is a basic flaw in one of the premises in the report, which I first commented on in this post. Holtham takes it for granted that a person's tax rate would be based on residence. I believe it would be much better to base it on workplace. I find Holtham's idea that Wales might set a lower higher rate in order to encourage high earners to live in Wales rather bizarre. I'm also slightly disturbed by the idea that the differential of either rate form England should be no greater than 3p. I say that based on what happened in Scotland when the SNP (with LibDem support) wanted to abolish Council Tax and replace it with a Local Income Tax. As I read it, they would have done so if they could do it within the 3p variable rate ... but the sums didn't quite add up. They would probably have worked with 4p. So the proposed 3p limitation very much ties the hands of any government that wants to do something radical with the tax system. The Assembly Government should seek discussions with the UK Government and the other devolved administrations about the feasibility of devolving corporation tax. But I suppose it's better than ruling it out altogether. We know that the ConDem coalition wants to reduce CT in Northern Ireland, and therefore it must make sense to establish a mechanism for a variation in Wales and Scotland too. But the big criticism I have of the report is that it appears to me to be missing the point of what taxes can be used for. The whole section on tax is predicated on the idea that if a government puts up rates of tax it will have more to spend on services, and that if it lowers rates of tax it will have correspondingly less to spend ... but that treats the economy as something static. I see tax as a tool to give the Welsh economy an international advantage. So if we, for example, by lowering business taxes encourage more companies to locate in Wales, or to expand their existing operations in Wales rather than in another country, we will have more jobs. What we lose in company taxation we gain by having more people paying income tax and fewer people out of work and on benefits. Holtham says yes to the first lever, maybe to the second, but doesn't even contemplate us getting any benefit from the third. That's what I find so disappointing about it. Yes, I've presented it in a simplified way, and I don't want to imply that it's as easy as that. Like flying a plane, you need a lot of skill and coordination to keep it in the air, let alone to get it to fly in the direction in which you want to go. In this context it is worth asking why the Scottish government has never used its one lever to vary the basic rate of income tax by 3p. To my mind it is only because there is nothing with which to balance that variation. You can't get a plane to turn using just the rudder, you need control of the ailerons and elevators as well. OK, so it's not as much as I would have wanted, but it's probably a good reflexion of what any current UK government is likely to give us. It would be unrealistic to expect Wales to get much more fiscal autonomy than is currently being proposed for Scotland on income tax or Northern Ireland on corporation tax. But there really is no reason why we should expect less than they are getting. But how do we implement these proposals? Or are we not going to implement them at all ... since there is a feeling among some commentators that this report will simply be kicked into the long grass? My feeling is that we must implement these recommendations in some form. The report runs through what things can be implemented simply by agreement between Westminster and the devolved administrations, and concludes that nearly everything can be done by agreement; but that tax setting powers is a change that will require ratification in a referendum in the same way as the Scots were asked a separate question on tax-varying powers in the 1997 referendum. I have to say that I question the need for this. There is no suggestion that the Scots are going to have to approve Calman in a referendum, so why should we have to go through it in Wales? As I said before, the previous tax varying powers for Scotland were so inadequate that they were never used, and could never realistically be used. What the Holtham Commission are proposing will give Wales broadly similar fiscal responsibilities as are (according to the ConDem coalition) now going to be given to Scotland without a referendum. Nor is anyone suggesting a referendum in Northern Ireland to set a mechanism to vary the rate of corporation tax there. Why treat Wales differently? In the end, the over-riding principle is No representation without taxation. Spending cannot be done in isolation from the responsibility of having to justify to taxpayers why their money is being spent. This set of proposals is way short of the fiscal responsibilities I want us in Wales to have. So let's not set another hurdle for us to jump over before we can take this first step towards fiscal responsibility. Thanks MH. I don't think having the power to vary Income Tax (but no other tax) is worth much - which political party would go into an election promising to raise IT? As we've seen in Scotland if wouldn't be used even if it would be good to do so. The tax which could be raised and which would be more equitable and help tackle other related problems especially in terms of housing stock would be Land Value Tax. I can imagine a party in the Assembly actually making use of this tax and to the benefit of the economy and most of the electorate. LVT would help improve the stock and general appearance of many of our seaside towns and student areas in which people who own property pay very little tax and who's profit generally contributes very little back to the infrastructure of the local community (although the benefit from the infrastructure which other tax payers pay a lot for - road, buses, shops, leisure centres etc). Why should we tax ('punish') people's labour and enterprise but not tax ('punish') people who do very little except own property? This is especially true as property raises in value only because of the labour and enterprise of others. Most successful and more equitable states have a strong variation of LVT as it focusess taxation and economic activity to proactive enployment and infrastructure and from benefitting those who make money from holding 'land banks' or generally waiting for others to invest in an area for them to make money in the sale or rent of their property. Thanks, Macsen. LVT is something that, in particular, is advocated by the Green Party. As I have a lot of time for the Greens I do have some time for the idea. Although I broadly agree with the philosophical reasoning behind it, I see that it does have flaws in a country that has very strict planning controls. LVT, by valuing land irrespective of the extent to which it has been developed, puts pressure on the landowner to utilize the maximum development potential of their land. That will always pull in one direction. But, for the good of wider society, some land is best left undeveloped (or rather developed for something less commercially rewarding). Open space for recreation and school playing fields for example. And do we really want to put pressure on an old part of a town of village, which may be charming and pleasant even if it falls below the threshold of being listed, to make way for more dense development? So although it makes sense in the context of developing unloved brownfield sites, it makes a lot less sense when society puts a non-commercial value on land ... for example, a social or cultural or historic value. Our planning system is able to take such non-commercial values into account. So I wouldn't rule LVT out altogether, but it and the planning system will often pull in completely opposite directions and, on balance, I think the planning system should win out. I agree fully with Holtham - but now is not the time to promote the concept of tax raing powers - it will just give ammunition to the TW bigots. I agree, Penddu, camau bach. Scotland have had these powers since the start, but have not found it expedient to use them, so there is no hurry! I'm glad, MH, that you agree with the 'philosophical reasoning' behind LVT. I'm absolutely baffled by your objection. There is no reason why LVT cannot work alongside, or indeed compliment, planning laws. You have to bear in mind that a certain amount of greenery, and a good school, can add value to property, and that there may be a vested interest for the local government to retain those spaces. In my opinion they should own them. But then you also have to consider to whom the LVT payment is made, central or local governemnt, or part and part. These are all issues to consider, and not to be used to dismiss the idea. I am very suspicious of your claim to have sympathy for the idea of LVT, only to dismiss it on the basis that there are minutiae to be considered in its application. According to Dr George Miller, 50,000 deaths a year in the UK can be attributed to the unfair tax system. You are willing to continue with a system where large swathes of the country live poor and die young, so that some people can sit their overworked and indebted arses on a park bench? Bravo. As for the issue of borrowing powers, which you support wholeheartedly, capital expenditure could be funded out of LVT by those who benefit from the capital expenditure. Why do you think all the railroad companies tried to get the government to fund the infrastructure whilst they bought the land around it? Because government was full of numpties like you. As for LVT not being paid out of cashflow, this is nonsense. It could be paid on a monthly basis based on the rental (economic rent that is) value of the land, unlike income tax which is currently paid as a lump sum annually. Another spurious argument. How often have I heard LVT damned with faint praise by people who either have failed to understand the most basic economic princiles behind it or who have a vested interest in avoiding it. You seem very keen to get the assembly government to borrow from commercial organisations. Hello? Look around. The reason it is a government's moral duty to collect LVT is so that the economic rent on land cannot be privatized eg, to commercial lenders. Cut out the middle man, and get the rent direct from the land, thereby negating the need to privatize it, and pay interest on the debt. The Assembly should not have powers to borrow, it should have powers to print its own money. That is exactly what commercial banks do in our fractional reserve debt money fraudulent system. MH, I'm glad you support the 'philosophical reasoning' behind LVT. It's just a shame you haven't understood the most basic bits of it. Why can LVT not work alongside planning laws, as do the plethora of inefficient property taxes currently in existence? Furthermore, LVT can compliment planning. A good school (with nice playing fields) will add value to local land, and add to the tax take. And as with current taxes, government will have to offset revenue benefits with other benefits. No change there. What a stupid argument. Dr George Miller MD in his book 'Dying for Justice' estimates that 50,000 people a year die in the UK due to the inequities of the tax system. You are happy to carry this on so that the odd overworked and indebted arse can be sat on the odd park bench (that wouldn't go anywhere anyway). How often have I heard LVT damned with faint praise by people who have either not understood it, or have a vested interest in retaining the privatisation of economic rent. MH, further evidence of your economic illiteracy (or vested interest) is to be found in your reaction to the request for borrowing powers to the assembly. Fiscal reformists (land taxers) would point out that capital expenditure could be funded by LVT on those who benefit from that expenditure. Why do you think the original railroad companies were so keen to pass the initial capital expense onto the taxpayer (wealth creators) while they bought the land where the line went? They succeeded because governemnt was full of numpties like you. It is a government's moral responsibility to collect economic rent through LVT so that it is not privatised. Economic rent is collected by someone. The choice is to privatise it for landowners or to return it to the pocket of those who spent on its creation. Monetary reformists the world over would point out that the powers the Assembly should have are the powers to print money, not borrow it. That's what the commercial lender you're so keen to borrow from will do in our fraudulent, Ponzi scheme, debt money system. Only they will charge the Assembly interest which they wouldn't have to do if they had a printing press. Gerry Holtham was an economic adviser to the Leeman Brothers and is a hedge fund manager so it's no surprise that he is advocating giving Wales (or whoever) borrowing powers. He is a strong believer in giving powers to the banks and ensuring that everyone is tied to them with interest payments. The Welsh Assembly needs large amounts of money to sort out the third world infrastructures of Wales and it needs the power to tax but NOT through income taxation and NOT through borrowing. I agree with those above who describe the benefits of land value tax. Not only is it the fairest, simplest tax system but it promotes social, ecomonic and environmental improvement. Wales is PERFECT for land value taxation. The Welsh Assembly should offer itself to the world as a pilot scheme for implementing land value tax and invite them to scrutinise and evaluate its development with all kinds of measures. This would put Wales firmly on the international map and would be the first step taken by Wales which is trully heroic and independent. George, I didn't "dismiss" the idea of LVT, I just pointed out what I see as the major problem with it. And I have no idea where you get the "not being paid out of cashflow" idea from. I'll just repeat the point I made. It would be up to whoever values the land to put a monetary value on elements which have no objective commercial value. The question is on what basis those judgements would be made. There is a danger that they would be subjective rather than objective, and that they would be subject to arbitrary change dependent on political value judgements. In my opinion it is better to tax people and companies on the money they actually make, rather than on someone else's idea of what they might make if they used the land they owned according to their idea of its potential. That should also answer Anon 12:01/12:07, although s/he seems more concerned with the concept of land ownership itself. And similarly for Anon 12:47, yes, it's fine to advocate a complete change to the taxation system, but Wales is in no position to do that now. And even the countries that have implemented some form of LVT have not completely abandoned the economics of the rest of the western world; they still borrow money in the market and still tax personal income and company profits. MH, again, you have failed to understand the basics. The market values the land. It is worth what the market says it is worth. Valuers don't decide what the value of land is, they just find out what the value of land is. Seeing as you are so adept at working out the 'major' problem with LVT, what would you consider to be the 'major' problem with the current system? The one that guarantees cyclical booms and busts and the pain for millions that ensues; the one that guarantees poverty; the one that guarantees inequity, where some are born with a life expectancy ten years shorter than others, just because of the tax system; that guarantees that the poorest will pay for the richest; that guarantees that gross inefficiencies remain in the system; that guarantees that many will not see the point in working at all, and are right; that guarantees that billions is lost in tax avoidance. Perchance your 'major obstacle' could be overcome for the benefit of those who work for their supper? So that they can have a fair wage and a fair crack at the whip? Yours, like arguments about valuations, agriculture and political reality, is a spurious argument perpetuated by those who eat at the Free Lunch restaurant, or by those who aspire to eat at the Free Lunch restaurant. MH, LVT doesn't propose to tax people according to what they might make if they used it in a certain way. LVT is simply a payment to the community for the services the community provides. It is based on what the market dictates is the value of the land. The businesses you mention would not, surely, be exptected to provide their services for free? Why should the community take money from some for the services that others receive? It takes a person of exceptional determination to only see the pros of any tax but not the cons, but you seem to be one of them, Anon. Your 15:03 assertion is quite wrong. It is very difficult to dissociate the value of land itself from its value when put to use. That value, paradoxically, depends on what the land around it is used for. So, for each piece of land, the valuation for LVT purposes is meant to ignore the use it has been put to, but must take into account what use surrounding land has been put to. Therefore an "underused" piece of land surrounded by highly used land would have a commercial value that depended on the surrounding use; and the owner would be under pressure to develop the land so as to be able to pay the LVT. Now that is a desirable outcome in many circumstances (one obvious example is the "unloved brownfield sites" I mentioned) but it is undesirable in other circumstances where the land in question has non-commercial value. I highlighted that problem. But your monomania prefers to jump to the conclusion that I have dismissed LVT and must therefore be personally endorsing every flaw in the world economic system. A greater sense of proportion and a less abusive tone might result in your next comments not being deleted. I have to agree with Penddu & Sionnyn, as Rhodri Morgan & Glyn Davies MP have raised similar concerns about this. Ok tax varying powers are not on the agenda in next years referendum, but this report will no doubt play into the hands of the No campaign. Most people in Wales have accepted devolution & are leaning towards further powers, but that doesn't mean to say that everyone knows how it works. The No campaign will use this report for their 'slippery slope' scaremongering tactics or 'Vote Yes, get taxed more' etc. MH - isn't it time you removed the ANON option from this site, especially as it is being abused, given that you have had to remove a number of anon posts, and if the tone of those that you left on are anything to go by, then they must have been truly abusive. Some people use ANON, but then sign their posts - I'm sure they would not mind registering. I prefer to make it as easy as possible for people to comment. But it would be nice if people did give themselves a pen name, just so that others can tell if Anon 12:06 and Anon 14:23 are the same person. A good idea is to use the "name/url" option when making a comment, but to leave the url blank. Apologies for the 'abusive' posts - they were borne of frustration. The posts removed were not actually abusive. One simply made the point that borrowing powers are dangerous in our debt money system, and that the Assembly should in fact have the power to print money, not borrow it. Subsequent posts expressed confusion at the removal of the above posts, and postulated that MH must not be keen on leaving at there as he may perceive monetary reform as more palatable to the electorate than fiscal reform, and more disadvantageous to himself. Again, apologies if this suggestion is offensive in any way. I would like to politely reiterate this point. There is a very close relationship between the two issues of a tax on economic rent (the surplus after the cost of production) and borrowing powers. Channelling economic rent into their coffers is the goal for the banks. Debt money is the vehicle through which this goal is achieved. That is why the Assembly (and any government) need to remove the motive by taxing the economic rent, and the means by retaining the power to issue the country's money. With regard the valuation issue raised by MH, the use of surrounding land is completely relevant to the value of land. That is what 'Location, Location, Location' is all about. Valuation is an objection constantly raised in discussions of LVT, but it is a red herring. Valuation was possible back in 1909 when Lloyd George tried to introduce LVT in his famous People's Budget and is even more possible today. With modern software it is a relatively easy job and the valuation of land, separated from any improvements, is regularly undertaken for various purposes around the world (including for various property taxes). Perhaps you could reinstate the posts so that all can see. With all due respect, your initial objections to LVT were on general principles. You pointed to weaknesses that you saw in LVT in general terms, and not in a specific Welsh context. 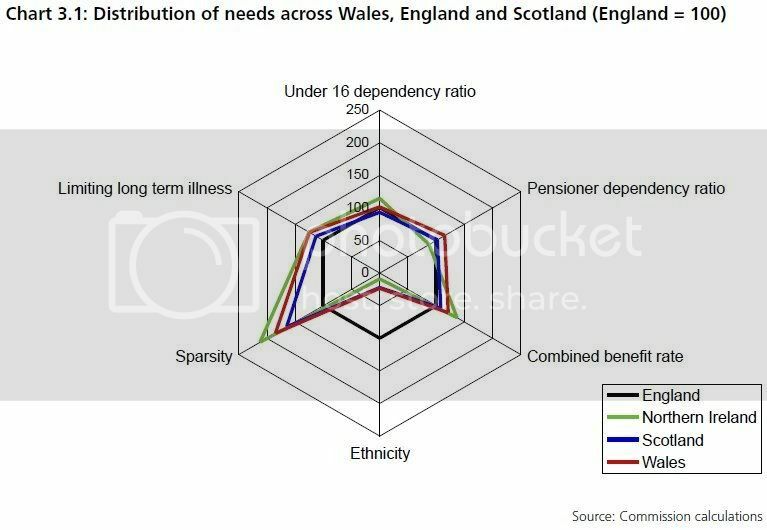 Clearly, the principle that LVT would be good for Wales needs to be established before there is any point in having a discussion on the practicalities of its implementation. With regard Holtham, he dismissed LVT during the consultation with discredited arguments, yet was willing for example to have a discussion about taxes on water, which is just a poor version of LVT. His motives, like yours, we can only guess at. Whilst you're right that it's fairly obvious that we aren't going to be allowed to turn the whole UK tax system on its head and that he does recommend the power for new taxes (page 101 - I have read it), that does not mean that we do not have a right, nay a duty, to discuss the best way forward for our country when the opportunity arises. Holtham presented such an opportunity. 3. The existing taxes it would complement or replace would be a matter for discussion, depending on the needs of the economy. I believe a good starting point would be income tax. Some argue it should be business rates and corporation tax, and I can see the point, but income tax is, essentially, a tax on employment and so would have the benefit of reducing both the tax liability of the employer and, possibly, the net income of the employee. I think this tax would make a significant contribution to regenerating places like the valleys, making them far more competitive with Cardiff, and obviously the rest of the world (although I'm not supposed to talk about that am I?). Also, it should be used for capital projects. Imagine if schools and road could be built with absolutely no extra burden on the wages or capital of the poor taxpayers of Wales. Sorry, I meant to say 'increase the net income of the employee'! I think MH that you're being a little abusive now. My guess is that George is trying to make a case for LVT in its entireity as it is quite a new idea (for me in any case) and it includes a different way of looking at taxation. I found George's last post very interesting to tell the truth. I would now be interested, as you noted, on how we can actually get that from the present set-up. But I think, as LVT is such a new idea and goes against the whole grain of Labour, Tory, Plaid and popular thinking (think of all those 'location, location, location' type programmes on tv) then it's not unreasonable that George is trying to open a wider debate on the macro merits of LVT. I also think you're being a little unfair. We've no possibility of fulfilling your long-term aim of a north-south railway. But I enjoyed your many postings on it and much work and thought (and passion!) you've invested in it. It's not going to happen tomorrow, may never happen, but I was glad to read a blog which had that courage to dream and make a strong case. Likewise, LVT may never happen in its 'pure' form (nor for that matter will Holtham!) but it seems is no less likely to happen than your north-south railway. Doesn't mean people shouldn't read about it and use it as a base for ideas. Keep the abuse out on both sides but keep the threads open, please. Masaryk, A north-south railway could be funded from the unearned increment in the value of land created. I mentioned the railways in one of my earlier postings. Another example is the Jubilee line extension in London. It cost £3bn, but increased the value of surrounding land by £10bn. Only a 33% tax was needed on the windfall provided by taxpayers for local landowners, and the line would be paid for. Of course, I would argue it should have been taxed at 100%, with the balance either channelled to other public expenditure projects or, better, as they do in some countries for example with tax on oil revenues, distributed as a citizen's dividend. Thanks George - interesting point about the Jubilee Line.